Next BSc Hons (Aerospace Medicine): January 2020. Application must be made to UP, on-line, before the 31st of July 2019. 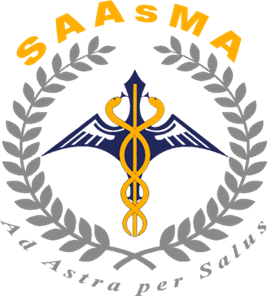 Finding relevant medical information on the SACAA website: The SACAA technical standards relating to medical matters can be found on the SACAA website using two methods (as described on the SAAsMA website). SACAA DAME Guide. Shortcut to the latest version (last updated July 2017 & authorised Aug 2017) https://goo.gl/ZVXmPO. Note that there are more recent medical updates (1 March 2018) shown at ‘SA-CATS 67 Medical Requirements’ on the SACAA website. EMPIC System: Busy migrating functions from Synova to SACAA. Mr Gauta Rakometsi is no longer directly involved. DAMEs experiencing problems must contact the SACAA personnel on standby at 060 997 9002 (weekdays until 20:00 and Saturdays until 14:00). Will the blood moon be visible in South Africa?